Deathlok you should feel free to thank Agents of S.H.I.E.L.D.. Because you are back in print thanks to Mike Peterson! 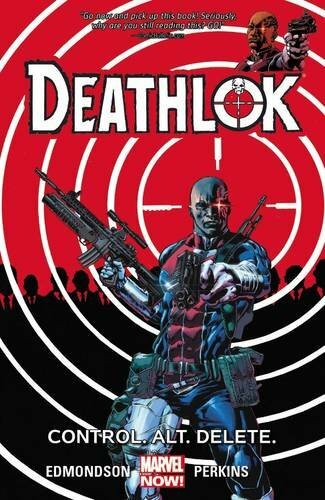 But will this new Deathlok by Nathan Edmondson live up to Agent expectations in Deathlok: Control.Alt.Delete. As the story opens a S.H.I.E.L.D. agent confronts Henry Hayes, an international aid worker, about his real life as a killer cyborg! It seems that Hayes is Deathlok and has remained one step ahead of a S.H.I.E.L.D. manhunt, and he does not even know it. The following pages follow Hayes as he attempts to balance life as a single father and international medic aiding those in the greatest need. Of course this is all balanced by his time as a mercenary. The reader discovers that Hayes is mind wiped after every mission and has no idea who and what he is. Along with seeing Deathlok’s worlds through Hayes’ unknowing eyes we also begin to see the mercenary’s adventures through his controller, a woman who sends messages to Deathlok through text messages in his eye. Will Hayes be able to balance his complicated life? Will control keep his other life secret? And what happens when his daughter disappears? It is clear quickly that Tuesday nights have inspired this title. Hayes is a single dad raising a daughter, whoops not a son. Hayes is very concerned about his child’s future and finds his life to be something that complicates time with this child. Though in Hayes’ case, his daughter is older than Peterson’s son and growing past him. Oh, and those message in his eye will totally feel familiar. You have to wonder is control in a strip mall? Yes this is an all-new Deathlok but it is inspired by Mike Peterson. I feel like there are enough connections to make agents feel comfortable, but since they did not 616 Peterson it is still not an Agent must read. Editors can we please tighten this up? Is it Aria Hayes or Arya Hayes? Because I am sure she knows how to spell her name. Does Henry work for Doctors Without Borders or Medics Without Borders? Maybe someone got worried about a lawsuit and made a change? I am sure many comic volumes have sloppy stuff in them. Stan Lee could never remember Bruce Banner’s name in his day. But usually I do not notice this stuff. But for some reason here it really stands out. Aria goes to see a band called The Zola’s. Discuss amongst yourselves! S.H.I.E.L.D. has an Internal Investigation unit and they are not a department you want to spend time with. They are tough! I think I am setup to like Hayes. He is a dad. He is a decent guy. He has a problem that is beyond his control. But at the moment I keep comparing him to Mike Peterson and not evaluating him on his own merit. So maybe another volume will help. Deathlok: Control.Alt.Delete is a book that clearly came about due to the Marvel Cinematic Universe. It was a solid enough debut full of drama and action. But in the end, I am still wondering why Mike Peterson was not the star of the title.